The maturation of concrete is dependent on three factors: mix ratio, time, and temperature. With respect to the maturation process, temperature is always in reference to concrete temperature, not air temperature. Of the three concrete maturation variables, temperature is the most difficult to control. Inconveniently, temperature is also one of the most important components in determining the compressive strength of concrete. When pouring concrete in winter there are some important factors to consider. The lower the temperature of curing concrete, the longer the maturation process take to complete. While low temperatures slow the curing process, a low curing temperature also results in a higher compressive-strength. Concrete that cures at 54-degrees Fahrenheit, for example, requires more time to reach a compressive-strength of 3,500 PSI than concrete cured at 90 degrees, but the former will cure with the capacity to resist higher pressures. Simply, the colder the cure temperature, the stronger the concrete. There is, however, a cold-temperature limit. If concrete cures at a temperature below 50 degrees, the maturation process is exponentially slower than temperatures above 50. Below the 40-degree threshold the speed of the maturation process is critically inefficient. At concrete temperatures lower than 40 degrees, the curing process advances at such a slow rate that a construction project becomes untenably delayed. But, there is a catch. Even if time is not a factor and pouring at the coldest temperature possible is not an inconvenience, if the temperature of curing concrete falls below freezing at any point — hence, the water in the mix turns to ice and the cement hydration process stops — the concrete is ruined. When the water in uncured concrete freezes, the concrete matrix — the chemical bond — is destroyed. Concrete will never cure correctly if it freezes prior to reaching the requisite compressive strength of 500 PSI. While a cold cure is ideal, allowing uncured concrete to freeze could lead to disaster. There are two means of accelerating a cure. Adding more cement to the mix ratio is one solution. A higher concrete to aggregate/sand ratio will speed the maturation rate. However, cement is merely an adhesive. It does not add significant compressive strength to concrete in relation to sand and aggregate. More concrete, meaning less sand and aggregate, makes for weaker concrete. A quick aside, the water content of concrete is a constant. Regardless of the temperature, the lower the sum of water in a mix ratio, the better. With respect to compression strength, the less water, the better, always. The other option for increasing the cure time and preventing uncured concrete from freezing, again, is increasing the temperature of the concrete. The higher the temperature above 50 degrees, the faster concrete cures. 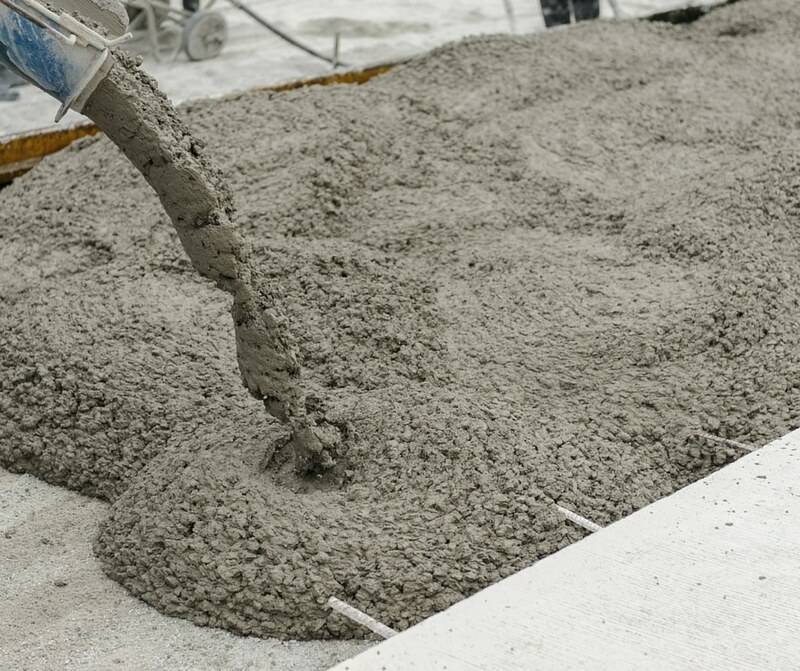 There are three means of keeping the temperature of concrete up: mix it hot; heat the ground prior to pouring; and cover the concrete with heat blankets after finishing it. Hot water heaters specifically designed for adding to a concrete mix, combined with the heat produced by the chemical reaction that occurs as cement hydrates, makes water cure more quickly. Hot water heaters are a reliable means of assuring that the temperature does not fall below freezing as you are finishing the concrete. While only a short-term solution, mixing concrete while hot gives laborers and finishers the additional time required to finish a pour with measured precision. Water heaters are especially proficient when used in conjunction with space heaters. Without space heaters, electric blankets can end-up amounting to too-little, too-late. Space heaters can be used to heat the ground prior to a pour and keep the temperature of concrete reasonably high while it is being poured and finished, until the concrete is ready to be covered. Blankets, of the three options, are the most critical. Except in the most extreme conditions, concrete will generally not freeze while being poured because the cement hydration process usually generates enough heat to keep the concrete above freezing until it is finished. Once it is finished, if the concrete is not covered and the ground and air temperature remain below freezing, there is a good chance that some — sometimes all — of the concrete will freeze. Covering uncured concrete with electric blankets will prevent this from happening. In conclusion, there are three things to remember about pouring concrete in the winter: temperatures above 50 degrees, but as close to it as possible is good for compressive strength; the freezing of uncured concrete is the worse possible scenario; and if you can only choose one means of keeping uncured concrete warm, choose electric blankets. Ready to get started on that next project? Don’t forget to take inventory of your tools and see what else you may need. Contact our team at BN Products for all of your concrete pouring needs or questions! Like this post? Share it with your friends! What are the Proper Concrete Mix Proportions?